Bill (Mr Kennedy to me, at the time) had recently taken his kids rock climbing at an indoor gym. The metaphor of rock climbing struck him as being analogous to parenting: you can make sure that your child is safe but the child needs to do the climbing himself. Your job is to call out the footholds if he doesn’t see them on the way up or catch him with the belaying ropes if he slips and falls down. But beyond that, you can’t climb the wall for him; the best you can do is offer safety and support from the ground. Now as I reflect on Bill’s metaphor I see the ways that it influences my work as a teacher: I want to point out the highest peaks alongside my students, encourage them to reach for the skies, protect them from pitfalls, and supply them with all of the tools they need to climb steep learning curves on their own. We will celebrate together once they have reached the summits of their own mountains because they, themselves, will be the ones responsible for the ascent. Bill’s metaphor of rock climbing left a mental frame for me to hang my ideas on, and over time I see that these ideas have amounted to a pretty accurate description of the kind of teacher I would like to become. And now I can’t see a rock climbing harness or hold climbing ropes on belay without seeing rich symbolic meaning. This December I had a chance to work on an exciting project in the makerspace with another one of my former Lit teachers who made lasting impressions on me, Liza Ewen. Liza’s ninth graders were reading The Piano Lesson, a play by August Wilson, which features a piano as a central symbol of a family’s shared history and an opportunity for the family’s future. For most characters the piano isn’t just a piano: characters see multiple levels of what it represents to them. 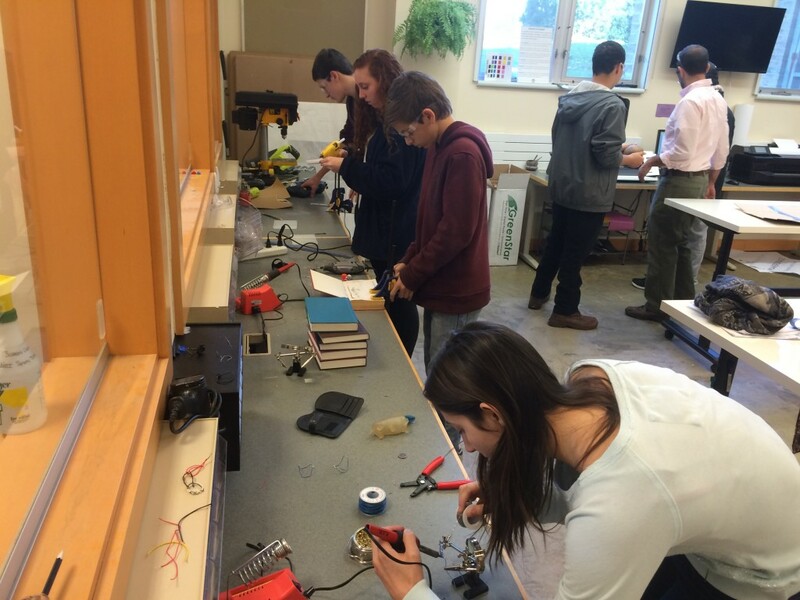 Liza’s idea was to invite students to have an analogous experience for themselves: to add layers of visible, shareable meaning to what otherwise seem like simple objects through a collaborative project in the makerspace. We started with a query: “In what way might we modify an object by extending, redefining, or replacing its original form and/or function in order to add meaning to it?” As students parsed this dense query and began to pursue ideas that resonated with their own personal experiences, they each brought in objects that held some sort of symbolic meaning to them. As we guided the students through each part of the query, a series of questions served as milestones: “What is your object?” “What is its significance?” And finally, “How do you hope to show that significance?” Students brought in copies of sheet music, favorite childhood books, VHS tapes they used to watch with loved ones, skateboards, pointe shoes, colored pencils, computer parts, poems, music boxes, and ice skates. Each student had something that seemed to you or me like just a thing, but to them held more meaning. Over four class periods of creative, hands-on thinking, pointe shoes became piñatas filled with hopes for the future, the magnetic tape in VHS videos became a head of hair in a self-portrait collage, musical scores turned into scrapbooks of friendship and growth. On an immediate, concrete level, there was lots of learning and skill-sharing happening all around us to make this possible: some students learned how to solder, others how to sew, others how to design and cut vinyl stickers, others how to carve with a dremel. It was fun to share these skills with each other (Liza, it turns out, is a magician with a sewing machine), and it was exciting to hear screeching saws in Lit class. In a more abstract way we were helping each other see things in new ways: baseballs became picture frames, maps became stories, books became vessels. And above all of that, perhaps most powerfully and most abstractly, we gained new ways of understanding: I personally acquired new metaphors and mental frames, shared creatively by students, to examine the world around me. Will those lessons last? Has the power of metaphor resonated with students in the same way it has resonated with me? Some students will not remember how to solder or carve or stitch independently days or weeks from now. And that’s okay — they have learned once and they can learn again. I am much more interested to know if these students gathered new mental frames to call their own. I recognize that is something that’s challenging to pin down and measure — in my own case, it was perhaps a decade until I came to understand my own thinking about rock climbing ropes and belaying harnesses. But my slow discovery is what allowed me to see that these mental frames are personal, powerful, and abundantly available for my consideration, and that they are embedded in the people and the stories and the simple, physical things all around me. I think that’s a lesson worth passing on; I hope Liza’s ninth grade Lit students would agree.